It’s that time of year again! All cadets are invited to come and join us for Yuletide fun on Sunday 11th December from 4.30-7.00pm (snacks 4.30-5.00pm). Tickets are now available and priced at a bargain £5 each, which includes party snacks, disco, games and a visit from Santa! You can buy them, as usual, from behind the main bar. Due to the expected demand and limited space, tickets are available for MEMBERS ONLY. Unfortunately, we are not able to reserve tickets – payment is required upon request. You can pay in the usual ways – cash, cheque, card transaction or bank transfer. So put on your best Christmas jumpers, come and have fun with your friends and get into the Christmas spirit! John Charles of Leigh-on-Sea Sailing Club has been kind enough to contact me and point out that their Brass Monkey race will take place on Sunday December 18th, 2 – 4pm. This is a correction to the 27th December, which may have been published in some of our sailing programmes. Please come and join us at the Club Tuesday 6th December at 8.00pm (8.30pm to start singing, please come early not to miss the start) for an evening of carol singing with Rayleigh Brass Band. All Club members and their guests are welcome. You will be able to enjoy some nibbles while you sing, courtesy of the Cruiser Section. Thanks to Toby Speller, Andrea Gal, Nick Cotgrove, Howard Warrington, Richard Sands, Janet Willsmer for covering these and also the others who offered after they were taken! Have you got your Yuletide Ball tickets yet? Come and join friends dancing to the Essex Undercovers – the band we had at the Midsummer Night’s Dream Ball in June. We are delighted to welcome headsUP! jazz quartet to TBYC. Congratulations to all Pico, Cadet & Senior prizewinners. It was great to see so many of you at the event on Saturday evening. There are also prizes for Pico and Cadet sailors waiting to be collected. 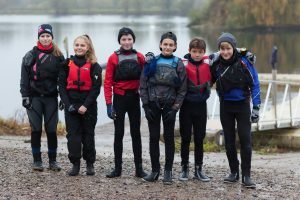 On Saturday 12th November, our Cadet Team Racing Squad travelled to Maidenhead Sailing Club to battle with Eton College with our youngest ever team. 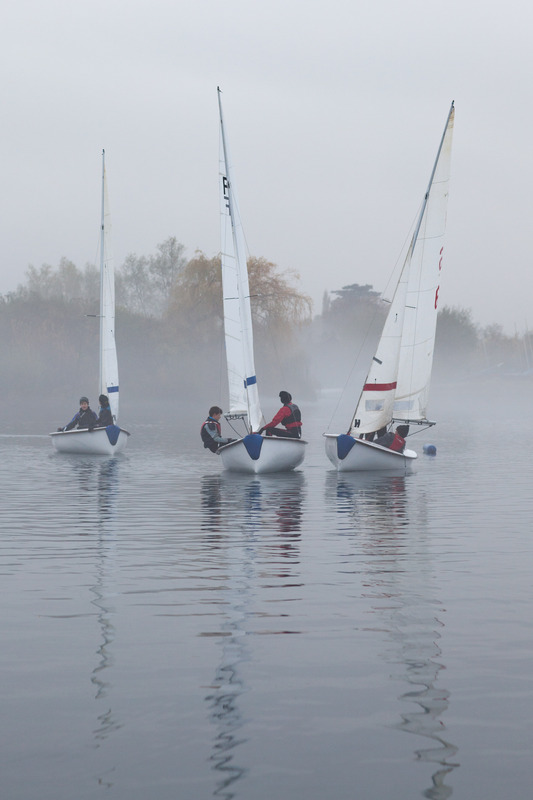 With great enthusiasm the boys and girls spend two evenings in the Sail training room studying the rules and tactics of 3 boat Team Racing and during the morning of the match, practising sailing in Eton’s boats. 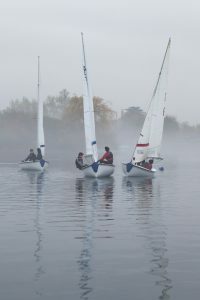 They effortlessly transformed their Pico sailing skills to the larger Fireflies and soon became proficient whilst practising starts and manoeuvres. The opposition arrived at 2.00pm and soon we were starting the first race. Ben and Joe soared into the lead, with Luke our Captain, with his crew Sam, co-ordinating the Team Racing tactics to maintain the overall lead. Louise and Dora battled away, but eventually the much older Eton side edged their way to a 11/10 victory. With only one point in it, which was amazing considering it was our first ever Team race, and determination we started the second race. 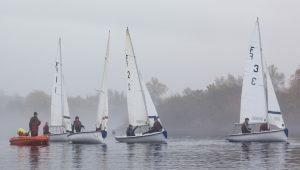 There was shouts of Protest from both sides, as each team put their tactics into practise, but eventually, as the wind dropped and the fog drew in, Eton managed to sneak in that one point again. Teas followed and the Captains of each team gave their speeches of thanks and enjoyment, and arranged a rematch. Well done Cadets! Thank you on a wet, grey Saturday morning. A huge thank you to the 20 or so people that came out this morning to get the boat park organised into a safer and more accessible space despite the heavy rain. I’m sure you all had better things to be doing this morning and a coffee in the bar afterwards is scant reward for your time and effort. There are still boats that need to be properly tied down. Please find some time this week to ensure your boat is secure. If it moves and damages other boats, we’ll end up with a lot of unhappy people. There are still many owners who haven’t paid for winter storage. This is nearly a month overdue and it’s quite clearly unreasonable to put our secretary in a position where she needs to chase you for payment. Please contact Janet THIS WEEK and honour your commitments. There is an increasing amount of bric-a-brac, broken trailers, windsurf boards etc accumulating in the boat park. We will shortly be taking measures to identify and where appropriate, dispose of these items. If you own any of this stuff, perhaps you’d be kind enough to identify it and advise your plans for it. Once again, thank you to the people that came out to help this morning. Dear TBYC members. 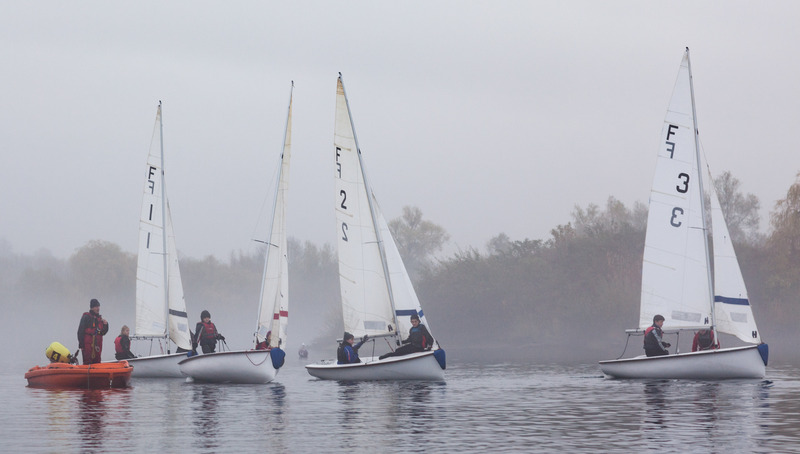 Three more Laser Pico dinghy’s, in addition to the existing three , are required for sail training and club racing for new members , and I am interested to hear from anyone who would like to sell or donate their boat to the club. The price will be dependant on age and condition. I would request that the Hull, Spars, Rudder assembly , Main Sail and Jib , and Trolley are in reasonable condition. Please contact me at the email below or on 01702 747969.